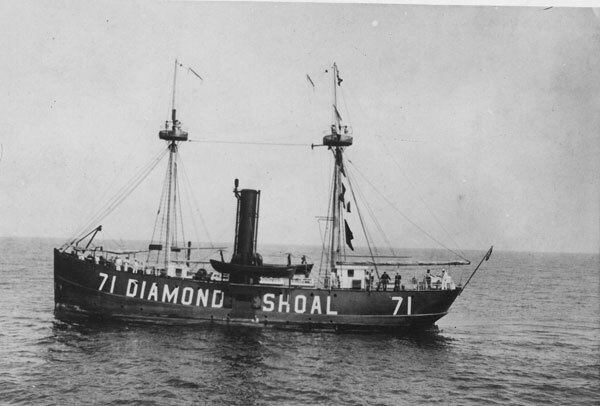 NOAA, with assistance from the U.S. Coast Guard, will manage the historic wreck of Diamond Shoal Lightship No. 71, the only American lightship to be sunk by enemy action during World War I. The two agencies signed a formal agreement between NOAA’s Office of National Marine Sanctuaries and the Coast Guard’s Historian's Office last month. Built in Bath, Maine, in 1897, the lightship, also known as LV-71, served as a floating lighthouse, sound signal station and navigational beacon. For 21 years, the lightship marked the treacherous waters of Diamond Shoals off of North Carolina to ensure other vessels could navigate safely. Then, on August 6, 1918, the German submarine U-140 attacked the vessel while it was anchored off Cape Hatteras. Before it was attacked, LV-71 had reported by radio the presence of a submarine that had torpedoed the unarmed American steamer Merak. The U-140 intercepted the warning, and after giving the crew the opportunity to abandon ship in lifeboats, sank it by surface gunfire. The lightship's crew of 12 reached shore without injury. According to A History of U.S. Lightships by Willard Flint, more than 25 friendly vessels were warned away from the area by the lightship. "Maritime heritage's powerful stories connect people to the sea," said Daniel J. Basta, director of NOAA’s Office of National Marine Sanctuaries. "The story of the heroic crew of the lightship is reflected by its sunken remains, and through them, our two agencies connect to share this special monument in the sea with all Americans." As a government vessel, the LV-71 is still owned by the United States. Under the agreement, NOAA, through the nearby Monitor National Marine Sanctuary, will conduct work required under the National Historic Preservation Act to document the wreck's physical remains, nominate the site to the National Register of Historic Places, and partner with the local community and Coast Guard to share LV-71’s story for the 100th anniversary of its sinking and beyond. Although the LV-71 is located in 180 feet of water, it is within reach of advanced technical divers. To help recreational divers better interpret the wreck site, NOAA will create illustrated dive slates and an online exhibit about the wreck and its crew is also planned.